Imagine a farm-to-fork fresh handcrafted egg sandwich served with house preserves and fresh brewed coffee as chaplains chat with college students about United Methodist mission and volunteer opportunities. Sound unlikely? It’s the primary mission of The Feed Truck, an innovative ministry model dreamed up by Kingston United Methodist Church (KUMC) as members reflected upon how they could best connect with college age students. “We’re in the business of serving up radical hospitality and a taste of hope to the good folks of Central New Jersey,” said Jessica Winderweedle, Executive Director of Feed Truck Ministries, Inc.
Winderweedle was a student at Princeton Seminary who was attending KUMC when she became part of the dreaming process for The Feed Truck. She had thought her 10 years of food/retail management experience prior to attending seminary, were wasted time. But that didn’t turn out to be the case. Her prior experience, partnered with a seminary class on missional entrepreneurship, helped fuel the idea. “My time in the field helped prepare me for this,” she said. KUMC first applied for a grant through the GNJ Board of Higher Education and Ministry for The Feed Truck. “It felt a little like the TV show ‘Shark Tank’, but they were nothing but supportive,” Winderweedle said of her experience working with the conference board. In addition, they applied for and received funding from the Global Board of Higher Education and Ministry. With the funding in place, the team began a long process of research and planning, working with many individuals including Ministry Incubators, a consulting firm comprised of Kenda Dean and Mark DeVries, who offered to assist in the planning and launch of KUMC’s food truck ministry at no charge. Dean is also the coordinating pastor of KUMC overseeing the pastoral intern partnership between KUMC, Princeton Theological Seminary, and the conference. KUMC is unique in that a majority of its pastoral leadership team is either currently students at Princeton Theological Seminary or recent graduates. After a lot of planning, organizing and work, The Feed Truck arrived and the permit process began. They opened for business at Kingston UMC’s Fall Arts Festival on Oct. 18 and served about 125 people. Since then The Feed Truck has been at a Trunk or Treat event at Trinity Presbyterian Church in East Brunswick, at CRW apartments (seminary housing in West Windsor) and on campus at Butler College at Princeton University and Princeton Theological Seminary. “Our operational philosophy is built on three organizational pillars: food, work and neighbor,” Winderweedle said. The Feed Truck uses as much local, farm-direct, seasonable, consciously sourced food as possible. “If we can’t tell you where it came from, we don’t want it on our truck,” Winderweedle said. In addition, 10 percent of the truck’s food and beverage sales is donated to other area non-profits. Winderweedle said that at least half of that goes to organizations dedicated to alleviating food insecurity and/or providing good work opportunities within their area. The Feed Truck is working to launch an apprenticeship program, this spring. It will provide skill training and career development services at a living wage to emerging adults who do not have the benefit of a strong support system or safety net. Through a partnership with KUMC, apprentices will be provided with community encouragement and relational mentoring. Winderweedle said the goal is to work with one or two young adults each year during a 6 to 12 month program “We want to give young people permission to dream and plan what their next steps might be,” she said. To find potential apprentices, The Feed Truck partners with agencies that provide support for young adults, such as Life Ties in Ewing, which provides both housing and social services for young adults in crisis. The Feed Truck also links diners with volunteer opportunities in the community, partnering with different volunteer organizations to raise awareness, in addition to funds. This is done partly through chaplains and interns at KUMC from Princeton Theological Seminary who chat with folks as they wait for their food. The long-range goal is to partner with a different non-profit each month, raising awareness on behalf of that particular cause, while also fundraising for it through food and beverage sales. She said that in Mercer County there are 53,000 college students and The Feed Truck would love to be on all the campuses. While The Feed Truck is filling its spring schedule now, a goal is to be on both the Princeton University and Princeton Seminary’s campus weekly. 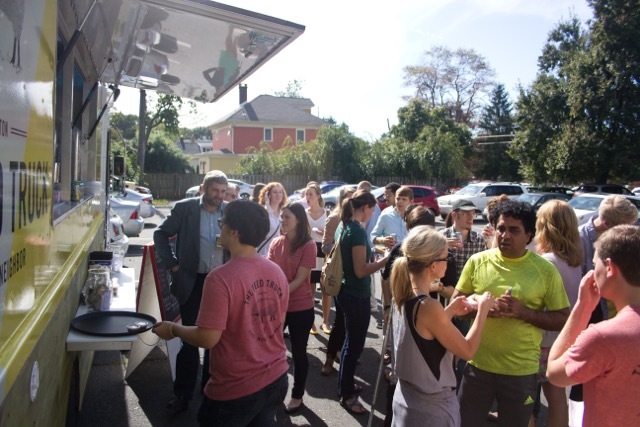 Winderweedle said there aren’t many food trucks in the Princeton area and when The Feed Truck was on the Princeton campus she kept hearing a lot of disbelief that a church was doing this. “I kept hearing ‘this is weird, but really cool,’ ” she said. Winderweedle said she sees The Feed Truck as the “pied piper” communication tool to share the message of the ministry. If you would like more information or are interested in booking The Feed Truck at a local church or community event, read more at thefeedtruck.org. The Feed Truck is also on Facebook, Twitter andInstagram. Executive Director Jessica Winderweedle.